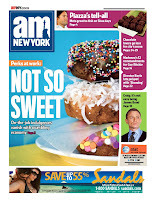 Checking out this very colorful, scrumdidillyumptious AM NY cover from last week, I am reminded of an old Jezebel post on the licking habits of the editor of Cosmopolitan. It went a little something like this: "My sense of a good cover that will sell is if I want to lick it... and the Beyonce [December 2007] cover I licked several times... before the sun came up." Now reconsider this AM NY front page. It has gourmet donuts with an added bonus of chocolates, a hot couple nuzzling on a picturesque beach, Daniel Craig looking dashing, something about Madonna and something for the sports buffs. If there is one thing I have learned about print and online media, people will read anything about multicolor baked goods, be they overpriced cupcakes or rare macarons. Now add some great graphic design to the mix and you have a very lickable issue. What's more is that everyone can identify with Cosmo's linguo love; I, for one, want to lick almost every page of every issue of Monocle. This is especially true for when they break out the illustrations in the retro style of Miroslav Sasek, or when they put a Frankfurter on the cover. I remain a reluctant fan of Tyler Brule, however, as his articles are so heavy-handed and pretentious. Like we get it, you love Toto toilets and Valextra. Anyways, I digress. Go lick some print journalism while its still around.